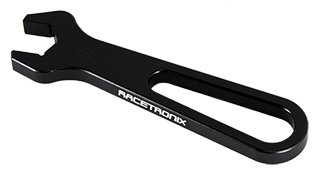 This wrench is ideal for field assembly and service of high-performance aluminum fittings to prevent slippage and scuffing. All wrenches are color-coded for quick glance indentification. For professional high-volume shop use or high-torque applications we recommend the use of a bench vise with our soft-jaws. We highly recommend the use of our hose fitting install kit and cool tool set listed under add-ons to the right of this web page.